It was my trip to Argentina that made me break down and buy that travel double stroller I had been avoiding adding to my increasing collection. We have a City Mini Double that we love, but the truth is that it does not travel well. When faced with the prospect of planes, trains and taxis, I wanted something that would fold up small but would let both my kids rest when they needed to. I found that in the Joovy Caboose. The Joovy Caboose is a tandem sit and stand stroller. The front is a regular stroller, with a seat that reclines, canopy, 5 point harness, and a tray for snacks and a sippy cup. The back has a platform and a small bench. An older child can stand and face forward when tired, or sit on the bench and take a rest when really tired. There was a basket underneath for storage, and a simple fold that allowed you to quickly fold up the stroller and carry it with the convenient side handles. How’d it work for us. I have to say it was one of the best last minute pre-trip purchases we have ever made. Both my kids instantly liked it. My daughter loved her seat with foot rest, and enjoyed having the tray to place things on. While she is not normally a nap-in-the-stroller kid, she found it comfortable and took most of her naps in this stroller while we were out and about. My son loved the bench. He’s a stickler for safety and liked that he could put on the three point safety belt all by himself. But he also liked that he could jump out and walk if he wanted to. He didn’t really take advantage of the stand part of the stroller. Occasionally as a novelty, but then he would sit down once he was over it. But what he really liked was that this was a big boy seat, and special just for him. With a baby girl, everything seems likes it’s just for her, so he liked having something that’s just for big boys. (While the website says it’s for 2+, I did put my 18 month old in it when my son wasn’t around and she was just fine). For me, what I loved was that as a tandem stroller, it fit down the sidewalks, public transit and aisles in the stores. 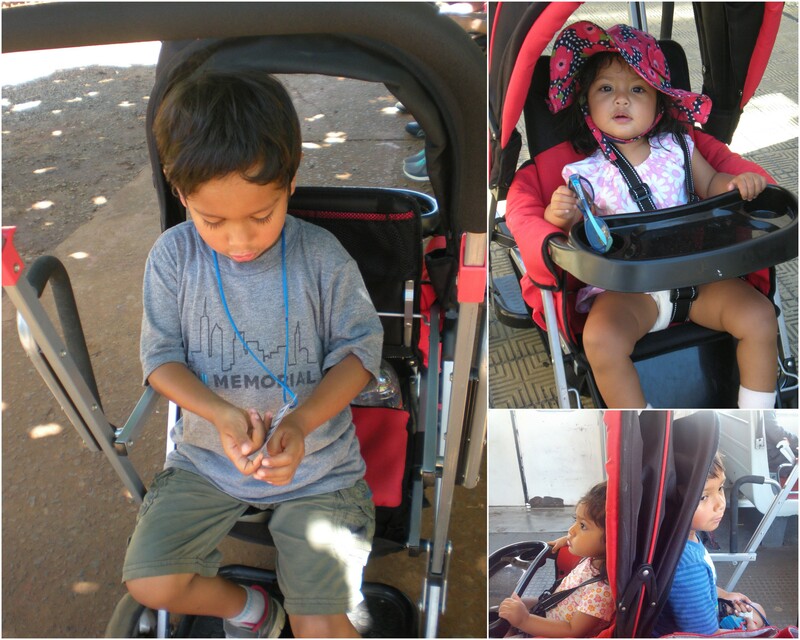 It is one of the shorter tandem strollers, and the front wheels swivel which makes is much more maneuverable than any other tandem stroller I’ve tried. And the big basket is very easy access from the side, allowing you to load it up quickly and easily. A huge plus was when my son was walking, it was still easy (if not easier) to push, as opposed to a side by side that gets off balance when one side is heavier. And if I was alone with just one kid, it didn’t feel like I was pushing a huge stroller. Most didn’t even notice the back when my son was out of it. As for terrain we covered the lot. 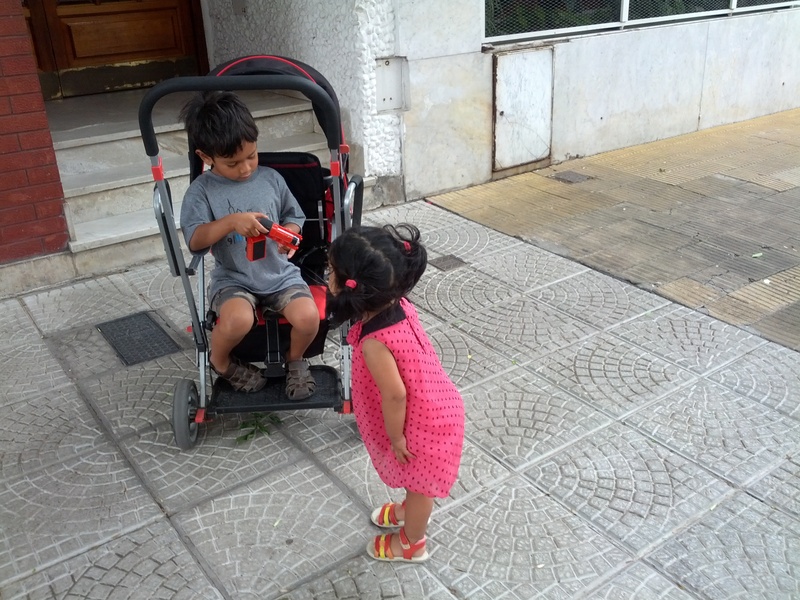 While it performed best in malls and museums, the stroller also did okay on the sidewalks. 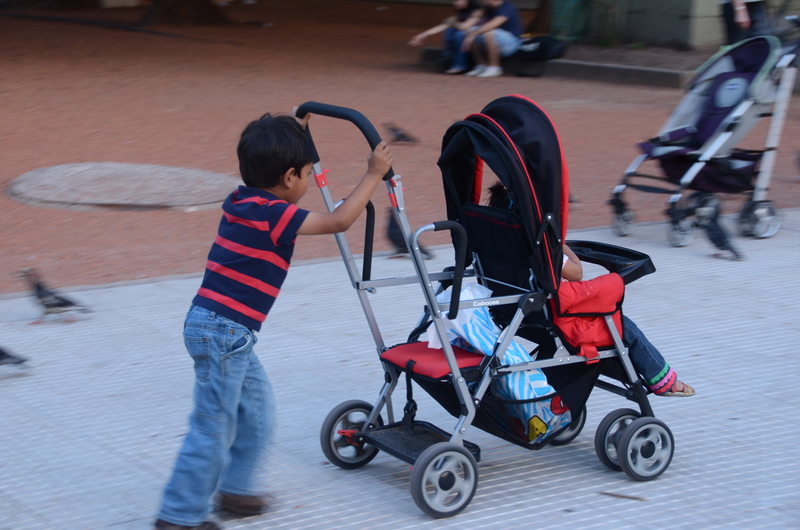 Many of the sidewalks were not well maintained in Buenos Aires, but we were still able to get the stroller over most of the potholes without too much trouble. We were even able to get it up curbs with the two kids in the stroller. We even used it through Iguazu National Park, rolling it over the pathways and bridges that are set up to see the waterfalls. 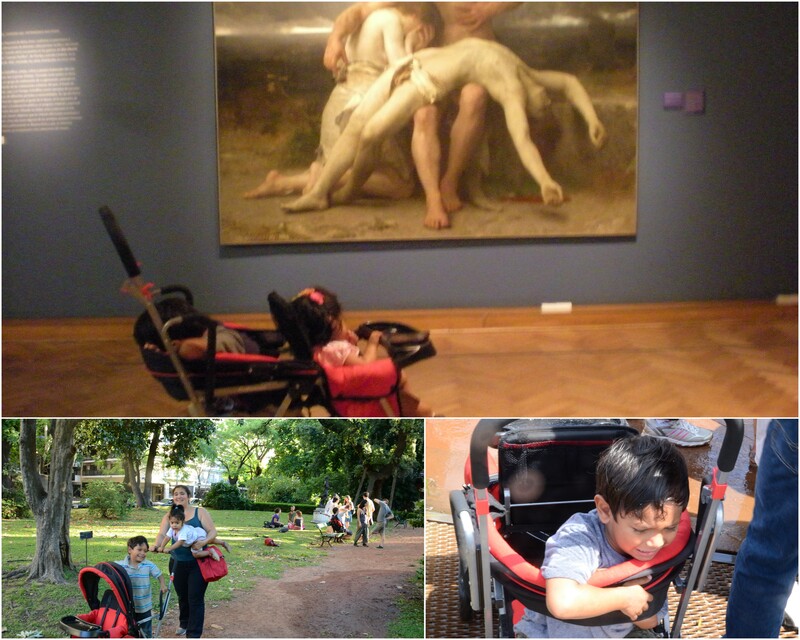 Parks, Iguazu trails, or museums, the stroller handled it all. A few things to consider before buying this. We bought a used stroller since it was intended just for this trip, and could not find the new Ultralight in our price range. Coming in at 26 lbs, this is not a light stroller. This is not a stroller you want to be lifting up and down stairs. And with my son at 40 lbs and my daughter at 20, at one point I was pushing over 100 lbs up a steep hill in the heat. It was exhausting. 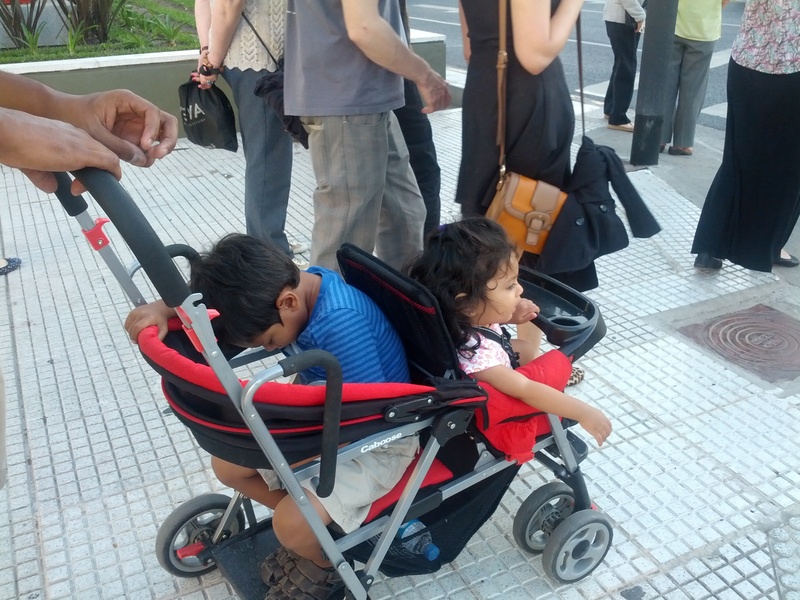 And while it folds up smaller than most double strollers, it’s not small. Folded up it was as tall as our Uppa Baby G-Lite and as wide as our City Mini. Since it doesn’t stand on it’s wheels like the G-Lite, it posed some problems on the bus. My husband often had to find a place to be able to lay it on it’s side, or if we were lucky, he got a seat and could put in in front of him. The biggest issue we came across was how the older child slept. Granted, this stroller is designed for older kids to ride in when they are tired of walking. But my son still naps in the afternoon, every afternoon. And he loves to nap in the stroller. The bench in the back did not provide him a place to lay back and nap. We eventually came up with a solution by moving the canopy all the way back and allowing him to lean forward and rest his head on this. While it worked and allowed him to sleep it caused two problem. 1. Now there was no canopy for my daughter and both were out in the sun, and 2. We noticed at the end of the trip that by using the canopy in that way we were causing some damage to the plastic in the canopy. Apparently having a 40 lb pre-schooler sleep on it every day is not in the testing process. If you are looking for a travel double stroller for two kids of different ages, you will love the Joovy Caboose. If you can spare the money and it’s worth it to you, the ultralight model does take 5 lbs off the weight. However, the Joovy Caboose itself is a great double stroller that we found withstood the test of daily public transit trips, several airplane rides, sidewalks not always in the best of shape, and two kids, one who often tried to escape but couldn’t and one who should have walked more but didn’t want to. Why are you in the stroller? Don’t you want to run with me? I’ve seen those before, and I thought they were a nifty-looking choice. The extra child doesn’t take up that much extra room. Getting it second hand definitely makes it worthwhile! Sounds like a great travel stroller for two small (er) kids! It is always a hassle to decide how to do it on trips, andbtw we now have only 2 strollers left after having 4 before 😉 At home our main stroller is a Phil and Ted’s explorer, which for a double stroller is great eg in public transport. It folds up but not very practical on longer trips. 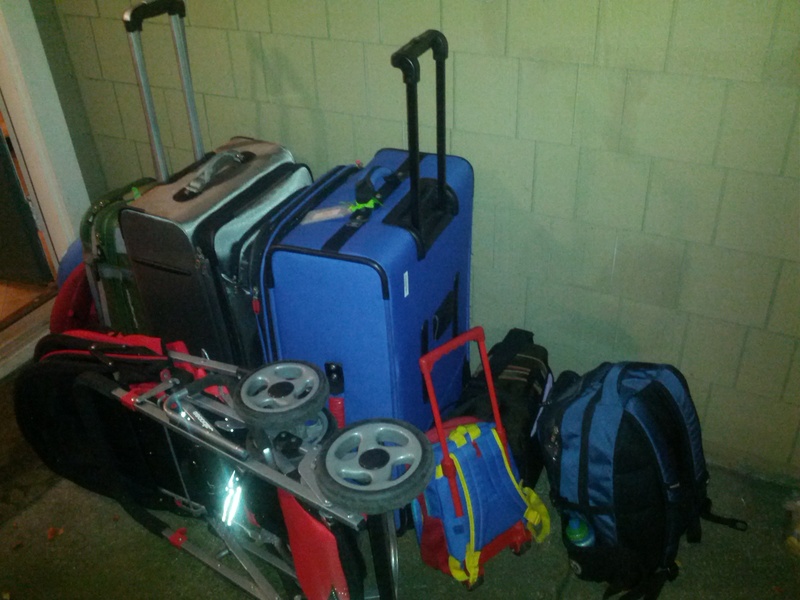 As our kids are 2 and 3, pretty good walkers and next longer trip with multiple flights is still further away, we are hoping not to accumulate the number of our strollers. If we decide otherwise, I think the Joovy caboose might be the one for us as well! 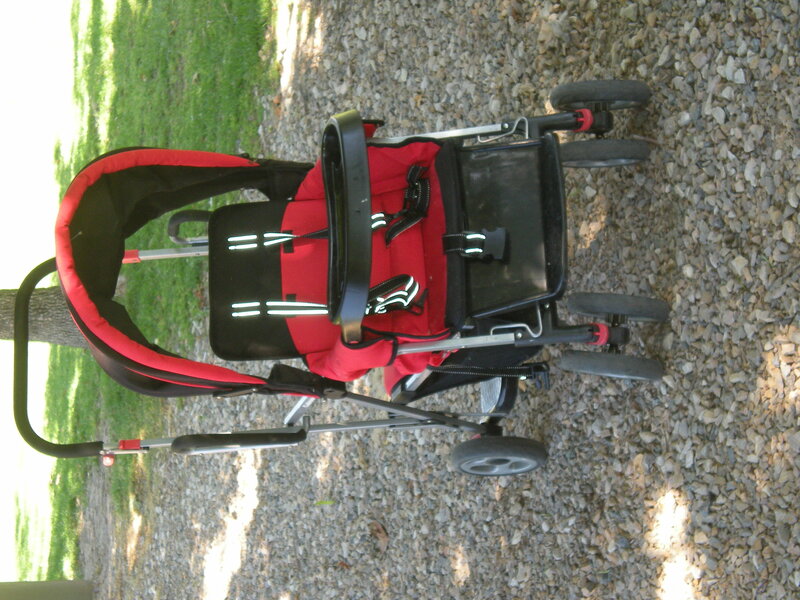 Aside from a simple umbrella stroller, the Joovy Caboose was the stroller I used most often. It is a bit heavy though.